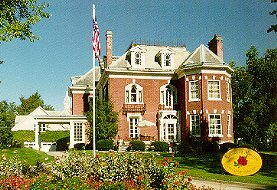 The Rosewood Mansion Inn, built in 1872 by Elbert Shirk, is a lovely Victorian home situated in Shirk's addition near the downtown area of Peru, Indiana. The Mansion has 19 rooms including 10 bedrooms, each with private bath. As a welcome change from impersonal hotel or motel accommodations, we offer the warmth and friendliness of a private home, coupled with the privacy and elegance of a fine hotel, for a combination that is truly a unique experience. Enjoy the warmth of the oak panel library, the splendor of the three story staircase with stained glass windows, the elegance of the Victorian parlor, or the comfort, charm and privacy of your room. Consider the Rosewood Mansion Bed and Breakfast for your next romantic getaway, anniversary, party, business meeting, or corporate retreat. Whether business or pleasure brings you to Peru, the Rosewood Mansion rewards you with a wonderful experience at a moderate price. This and other Peru Bed and Breakfast Inns can be found here in The Register.